No more losing sleep over space restrictions: HIS, the gas-insulated switchgear for indoor and outdoor use requires less than half the space of comparable air-insulated switchgear. The 8DQ1-type HIS is a compact switchgear solution for rated voltages of up to 550 kV produced by SIEMENS. 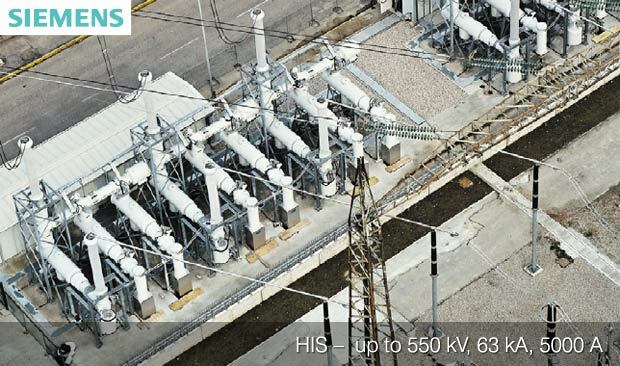 It is used mainly for cost-efficient renewal or expansion of air-insulated outdoor and indoor substations, particularly if the operator wants to carry out modifications while the switchgear is in service. New construction projects, high site prices and increasingly complex approval procedures make space prime factor in costing. With the HIS solution, the circuit breakers, instrument transformers, disconnecting and earthing switches are accommodated in pressure gas-tight enclosures with a minimum of five independent gas compartments, which makes the switchgear extremely compact. Thus, you can meet the growing demands on your switchgear within the scope of the existing site. HIS switchgear is single-phase encapsulated in order to keep dielectric and dynamic stresses to a minimum. The switchgear is clearly laid out on a single level. Its enclosure is made of aluminum. As a result, the switchgear is corrosion-proof and exceptionally lightweight. State-of-the-art design methods and casting techniques permit optimum dielectric and mechanical construction of the enclosures. Sulfur hexafluoride (SF6) is used as the insulating and arc-quenching gas. All modules are attached to one another with flanges. The gas-tightness of the flange joints is ensured by the Siemens O-ring sealing principle, proven over decades of service. Gas-tight bushings permit subdividing the bay into several distinct gas compartments. Each gas compartment is fitted with its own gas monitor, rupture disks and filter material. Static filters absorb moisture and decomposition products. In the improbable event of a fault, rupture disks prevent unacceptably high pressure buildup in the enclosures. When activated, diverter nozzles ensure discharge of the gas in a defined direction. The outdoor-proof enclosures and operating mechanisms are fitted with space heaters. Screws and nuts are corrosion-proof. For air-insulated switchgear (AIS) and gas-insulated switchgear (GIS), the same interrupter units and operating mechanisms are used. The use of this platform concept in a wide range of applications has provided us with decades of comprehensive experience. The circuit-breaker is suitable for single-pole rapid auto-reclosure. The stored-energy spring operating mechanism provides the force for opening and closing the circuit-breaker. State-of-the-art production techniques allow using compact, corrosion-proof aluminum housings. Since the closing and opening springs are housed in the operating mechanism, the structure is compact and sturdy. This design results in a small number of moving parts. The use of roller bearings and the maintenance-free spring mechanism are a prerequisite for decades of reliable operation. Proven design principles, such as vibrationisolated latches and load-free isolation of the charging mechanism, are retained. The interrupter unit used in the circuit-breaker for arc-quenching operates according to the dynamic self-compression principle. This principle requires only low operating energy thus keeping the mechanical stresses on the whole circuit breaker to a minimum. In the closed position, the operating current fl ows through the main contacts (2, 10). The arcing contacts (1, 7) are plugged in in parallel to the main contacts. During the breaking operation, the main contact (10) opens and the current commutates to the arcing contacts (1, 7), which are still closed. This avoids erosion of the main contact. As the breaking operation continues, the arcing contact opens and an arc forms between the contacts (1) and (7). At the same time, the contact cylinder (10) compresses the SF6 gas located in the compression volume (4). The compressed arc-quenching gas fl ows through the heating volume (11) into the contact gap and extinguishes the arc. In case large short-circuit currents occur, the gas between the arcing contacts (1) and (7) is heated by the arc’s energy and is driven into the heating volume (11) with high pressure. When the current passes through zero, the gas fl ows back from the heating volume through the nozzle (9) and quenches the arc. The valve (3) of the contact cylinder (10) prevents the high-pressure gas from entering the heating volume. Thus, the arc quenching energy does not have to be supplied by the operating mechanism. Disconnecting switches assure a dielectrically safe gap between both contacts for secure isolation of system areas of different potential, e.g. busbar disconnecting switches isolating a whole feeder from the busbar. Cast-resin bushings keep the contact system in place and the pressurized gas serves as the isolating medium between live parts and the metal housing. The module is available with up to two earthing switches and the necessary connectors for different types of adjacent modules. Disconnecting switches can be built as separate gas compartments with their own monitoring or be combined with surrounding modules. Earthing switches (e.g. work-in-progress earthing switches or busbar earthing switches) are used for properly connecting deenergized live parts of the high voltage system to the ground. On the outgoing side of the feeders a make-proof version (high-speed) is frequently used to eliminate risk to the GIS system, e.g. if the opposite side is not switched off properly. The insulated version is used for measuring purposes and for testing protection relays. In 8DQ1 switchgear, the earthing switches are of a pin-type design. They are preferably used in conjunction with disconnecting switches, but can also be supplied as separate modules with their own housing. With the pin-type earthing switch, the earthing pin at earth potential is pushed into the mating contact. Make-proof earthing switches are equipped with a stored-energy spring mechanism. The spring can be recharged either by a motor or manually in an emergency. Do you know if it is there a system (such as a porthole or a video camera) which permits to control the state of the poles at any time? My company would like to install HIS but we have rules that force the maintenance technicians to visually controll the state of the switchgears before starting to work in the area (and it oviously has to be open). Thanks for that awesome posting. It saved MUCH time Deference to author , some great entropy. Thank you very much! We’ll keep posting best we can!